Healing Arts Press, 9781594771583, 336pp. David Winston, RH(AHG), is an herbalist and ethnobotanist who has practiced Cherokee, Chinese, and Western herbal medicine since 1969. He is the president of Herbalist and Alchemist, Inc., a company that manufactures over 300 herbal products, author of Herbal Therapeutics and Saw Palmetto for Men & Women, and coauthor of Herbal Therapy and Supplements and Adaptogens. He lives in Washington, New Jersey. Steven Maimes, the former owner of an herbal products business in the San Francisco Bay Area, is a researcher, freelance writer, and principal of SALAM Research in Rochester, New Hampshire. 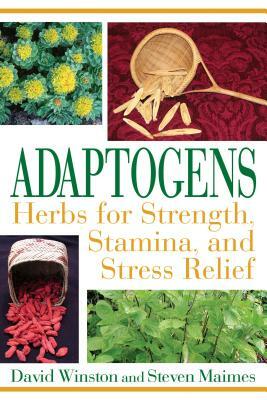 "Adaptogenic herbs can be most useful in the quest for health in our stressful society. David Winston and Steven Maimes explain and champion the use and benefits of these important herbs." "This is a much needed book, an important update to the materia medica of North America, and constitutes important continuing education on a wide variety of new herbs entering into the North American herbal marketplace." "It's about time a book took on the subject of immune herbs, and this one does an excellent job of explaining why they are so effective at combating stress-induced illness. The text is very easy to read and understand, but still contains the latest scientific research, all well referenced." "There is so much valuable information packed into this volume that I am grateful to have my own copy and will keep it close by as a very handy reference"